That's what I kept telling myself on election night. The outcome was so important to the safety of my family and, more importantly, it had the potential of being devastating to the freedom of the church. It was truly a historic night! But, my friends, there is no time to celebrate. God has only given us a momentary reprieve. At best, we have two years until the next election cycle will once again put our resolve to the test. We are just one vote shy of a Supreme Court that can radically challenge the core of Christian values and bring significant limitations, even outright persecution against the church. Did we get close enough to the edge? Are we awake? Will our alarm translate into our resolve? Over the next few lessons, we will highlight a series of vital actions that must be taken immediately in order to communicate to Heaven that we have learned our lesson and we appreciate this momentary reprieve. Important Note: In order to circumvent the inevitable naysayers, it is important that I make this disclaimer. America is NOT the kingdom of God. While she has been irrefutably advantaged by Divine providence, America is only one nation in a long line of nations who have been blessed because God's children live within the nation. Donald Trump is not our Savior. He is only one ruler in a long line of rulers who has been given the opportunity to protect and promote God's children. Should he falter, like Nebuchadnezzar, he could easily find himself grazing like a cow on the front lawn. Christians are the salt of the earth and the preservative of a nation. When we passionately turn our hearts toward God, it matters little who is in the palace or the White House, God WILL move on our behalf. On the other hand, when there is sin in the camp, God's blessing will be removed from us. Application: The absolute best thing we can do for America is cleanse the church. Over the next few months, a heated debate over the best way to deal with illegal aliens will dominate our national dialogue. 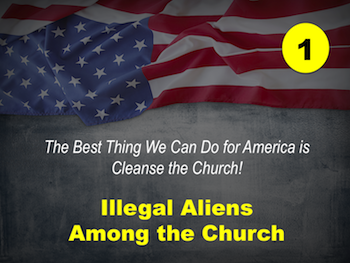 As it does, I pray that we will also be reminded of the much more important issue - illegal aliens masquerading as church members. They have never been properly taught about the lawful way to gain citizenship. They have criminally disregarded the process and placed their own will ahead of the law. Ironically, those are the very same reasons that illegal aliens attempt to be part of the church. Q: How do we deal with these two groups? A: In very different ways! There are two very sad results to the deception of "back door" citizenship. The perceived value of true citizenship is diluted. The alien is led to believe he is a citizen when in reality he is only an accepted imposter. In Romans 6:3-4, the Holy Spirit gives this simple description of the front door entrance, "Or don't you know that all of us who were baptized into Christ Jesus were baptized into his death? We were therefore buried with him through baptism into death in order that, just as Christ was raised from the dead through the glory of the Father, we too may live a new life." Baptism is the very threshold of entering into Christ. It is the precise moment at which a person discards his citizenship in the world and accepts his citizenship in the Kingdom. Q: If baptism puts us into Christ (Romans 6:3-4), how can a person be a saved member of the Kingdom without making the free will choice to be baptized into Christ? A: They cannot! If a person is not in Christ, they are not in the church. They might attend services regularly and they might participate in her many programs, but if they are not in Christ, they are not in the church. They might even be a seminary graduate and an "officially" ordained pastor with many years of experience, but if they are not in Christ, they are not in the church. (Study Matthew 7:21-23.) They are self-diluted illegal aliens. Note this! Baptism is essential for salvation and for citizenship. To be in the Kingdom, you must enter through the lawful door called baptism. Have you been baptized for the purpose of removing sin (Romans 6:3-4, Acts 2:38)? Does your preacher, pastor or pope preach baptism for the remission of sins? Be careful who you trust. Human accolades do not replace Divine command. The second group, those who criminally disregard the process and place their own will ahead of the law, must be shown the exit. This group is primarily made up of false teachers; those who should know better, but refuse to cast off their selfish ambitions and submit to the whole counsel of God. Next time we will look at the topic, "Draining the Swamp (Exposing and Removing False Teachers)." I pray that you will join us for this revolutionary call to arms. Conclusion - Aliens Among Us! Just as America has cast a blind eye toward those who circumvent the law and have assumed an undocumented status, the church has also been too casual with the enforcement of God's standards for citizenship. For centuries, a group of religious elitists has promoted a doctrine of human will over Divine command. From Catholocism to Calvinism to Reformed Theology, Christianity has labored under the intellectual slavery of those who elevate their will above the inspired Word of God. In order to communicate to Heaven that we have learned our lesson and we appreciate this momentary reprieve, illegal aliens must either be invited through the front door or purged from our midst. The Best Thing We Can Do for America is Cleanse the Church! : "Draining the Swamp"
"Building a Wall, Part 1"
"Building a Wall, Part 2"
Back to Top of "Illegal Aliens Among the Church"